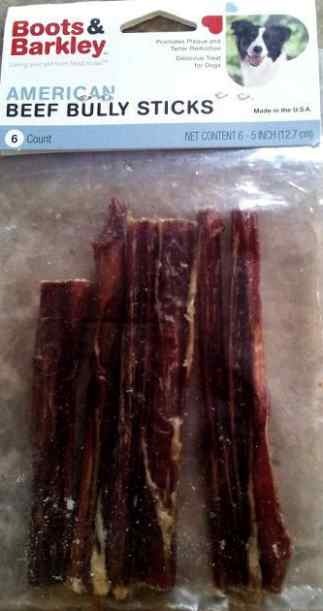 Kasel Associated Industries of Denver, Colorado is recalling its Boots & Barkley 6 count 5 inch American Beef Bully Sticks because it may be contaminated with Salmonella. The bacteria can sicken animals who can pass it to humans, and people can get sick by handling the contaminated product. The products were distributed nationwide through Target stores from April through September 2012. The pet treats are packed in a clear plastic bag marked with bar code number 647263899189. All lot numbers are recalled. The lot codes that tested positive for Salmonella include BESTBY20APR2014DEN, BESTBY01JUN2014DEN, BESTBY23JUN2014DEN, and BESTBY23SEP2014DEN. No illnesses have been reported to date in humans or animals in connection with this product. The State of Colorado Department of Agriculture found Salmonella in the finished product. The company has ceased production and distribution while the FDA and the facility investigate the source of the contamination. For questions, call Kasel at 1-800-218-4417 Monday through Friday from 7:00 am to 5:00 pm MT. If you have purchased this product and are suffering the symptoms of Salmonella food poisoning, including nausea, vomiting, diarrhea or bloody diarrhea, abdominal cramps, and fever, see your doctor immediately. The long term complications of Salmonella can be serious, including arterial infections, reactive arthritis, and heart disease. Some pets may be lethargic, have bloody diarrhea, fever, and vomiting if they contract a Salmonella infection. See your veterinarian if your pet is not well. Thank you so much for providing this venue.